These are fabulous, and colors are amazing! You did a great job with the papers, Marinette. Both cards are beautiful. Et tu as fait là deux super cartes, pepsy! Merci beaucoup! Fabulous cards! You have such a fun and funky style - I love it! YOu use such vibrant colors, that top one is soooo cute! Love the purples. What wonderful bright and happy papers and I love the little birds! Great job on both! I think you did a great job on both of them! 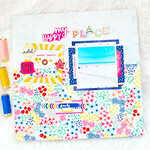 Love the bright colors and the Say It With Style stamps look great on them! Ces cartes sont très jolies! J'aime le peps qu'elles ont ! Bravo ! !